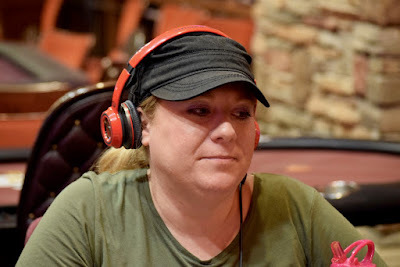 Down to her last 5,000 chips, Carrie Diggs was forced by Thomas Emerson to make a decision for her tournament life one level before registration closed. Diggs found a fold, found herself searching for a double-up, and managed to get to the registration break with some chips still in front of her. It's been constant stack-building since registration closed and Diggs has added ... 15x ... yep, FIFTEEN x ... to her chips since then, now sitting at 75,000.